The leaders of North Korea, Kim Jong-un, and South Korea, Moon Jae-in, pledged to work towards a "complete denuclearization" of the peninsula during the historic meeting held this Friday. "The North and South confirm the common goal of achieving, through complete denuclearization, a Korean peninsula free of nuclear weapons," they said in a joint statement. They also indicated that this year they will seek "a permanent end" to the War of the Koreas, which ended in 1953. This will put an end to 65 years of hostilities after the conflict ended in an armistice, and not in a peace treaty. Kim and Moon indicated in their declaration that they will plan meetings with the United States and possibly China "in order to declare an end to the war and establish a permanent and solid peace regime," the leaders declared. In their statement, Korean leaders indicated that they will carry out "close coordination" to ensure that "the unfortunate story is not repeated" in which past inter-Korean agreements failed. "Maybe there will be hardships, difficulties and frustrations on our way," Kim Jong-un declared, "but victory cannot be achieved without pain." 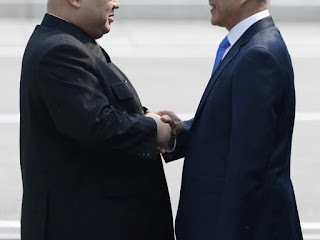 The declaration came after both leaders held talks during the historic meeting, in which Kim Jong-un became the first leader of his country to cross the border southward since 1958. And it emerges after months of tensions and belligerent rhetoric in the region and in the world over North Korea's controversial nuclear program. The leaders did not disclose the details of how the denuclearization will be carried out and many analysts are skeptical about what they say is "the apparent enthusiasm of commitment" of North Korea. At the same time, a few months ago, when North Korea continued with its nuclear tests and increased its rhetoric, very few thought that an approach like that now being seen was possible. Kim's change occurred in January, when he suggested that he was "open to dialogue" with South Korea. And a month later both countries marched under the same banner at the opening ceremony of the Winter Olympics. Among the points agreed by Kim and Moon in their joint statement are: An end to "hostile activities" between the two nations. The change of the Demilitarized Zone that divides the peninsula into a "zone of peace", in which its propaganda transmissions will cease. A reduction of arms in the region that will depend on the attenuation of military tension. Exert pressure to hold tripartite talks involving the United States and China. Organize a meeting of the families that were divided by the war. Connect and modernize the railroad tracks and roads across the border. And continue joint participation in sporting events, including this year's Asian Olympic Games. On Friday, US President Donald Trump tweeted his reaction to the statement by Korean leaders. "THE KOREAN WAR IS GOING TO END! The United States and all its GREAT people must be very proud of what is happening now in Korea!" He wrote. He added: "Good things are happening, but only with time!" China praised what it called "the political determination and courage" of the leaders of North and South Korea to take "a historic step. The Foreign Ministry of that country indicated that Peking expected the meeting to mark a turning point towards long-term stability in the peninsula. Japan's prime minister, a country that had been threatened with North Korean missiles, also called it "a positive step." Shinzo Abe said he expected Pyongyang to take concrete actions to fulfill its promises. The summit meeting of the Korean leaders, which was planned for months, has been closely watched by the international community because it is expected to pave the way for the most critical meeting with US President Donald Trump. Some analysts warn that once those negotiations begin if they happen, it will be when North Korea will show its true commitment to denuclearization, because Kim could demand that Washington also participate in the arms reduction talks. "This (meeting) provides a political space for Trump to hold his own summit with Kim," Duyeon Kim, a researcher at the Forum on the Future of the Korean Peninsula, told Washington Post. "But if we should believe Kim Jong-un or not, it's a completely different story," he adds. Now it is expected that both South Korea and the United States will try to persuade Pyongyang to agree as soon as possible on a specific timetable for denuclearization. And many wonder if this can be achieved before the end of the administration of Donald Trump, early 2021.